In the wake of the previous article on How Many Peasants, out of curiosity I zeroed in on an island that is part of a larger province, to see how numbers stack up in a small setting. 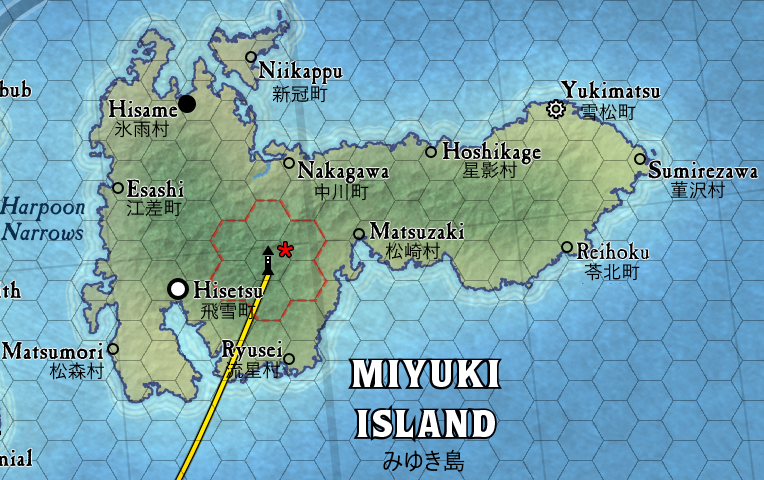 I chose Miyuki Island for this experiment. 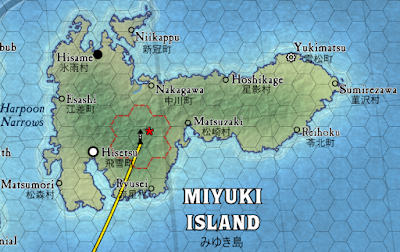 According to CAL1 In Stranger Skies, shipwrecked Kumoshimans settled this remote corner of Caldwen's magiocracy after their fleet crash-landed there as the result of a malfunctioning Kahuulkin gate. It eventually became part of the province of Garamial, in the College of Invocations. What do we know about this province? Island Area: 5,897.00 sq. miles, 60% of which is settled land. Based on original numbers established from Garamial's demography, the island's main town, Hisetsu, is home to 12,299 folk, which includes a local militia of 287 people. The fortress of Yukimatsu houses a permanent garrison 186 strong (they are the brave fellows on the lookout for Godzilla-style visits from the sea). The total number of troops on the island adds up to 473. 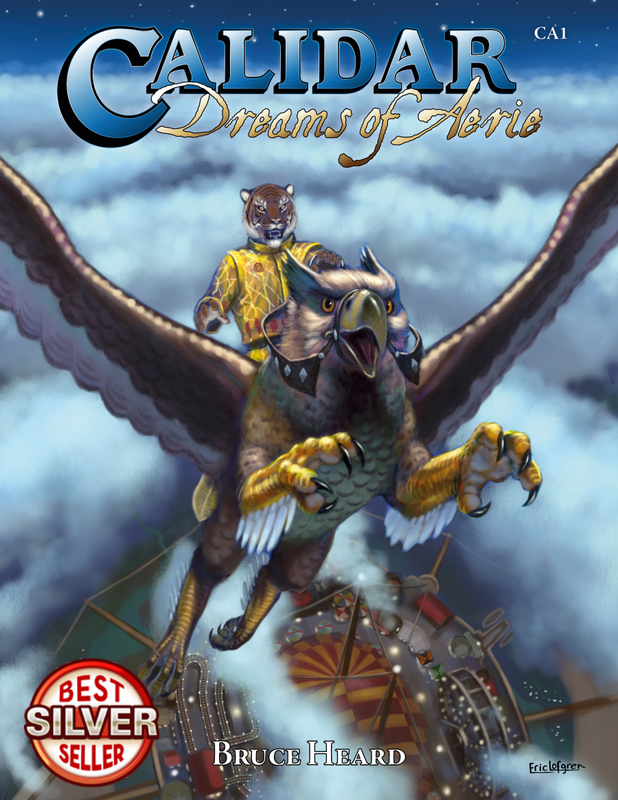 Garamial and most of the magiocracy's other provinces provide a certain number of permanent troops to the High Wizard Chancellor in Arcanial (the realm's capital city). In other words, these are like "royal troops" as opposed to local militiae which are paid for and under the command of provincial authorities. These permanent forces form Caldwen's standing army. They are typically posted to the various out-of-town fortresses guarding Caldwen's coast. This includes Yukimatsu. I'd established earlier that not more than 3.5% of urban population belong in the military. This means that the island itself supports/provides up to 430 native Myukians (ethnic Kumoshimans) to various military roles. This falls a bit short of the total 473 troops actually on the island. The remainder, 43 round-eyed "strangers," therefore came from the mainland and are most-likely posted at Yukimatsu. If so, then the 186-strong fortress garrison counts 143 ethnic Kumoshimans plus the 43 "strangers" (23% of the garrison). Voilà! You'll be pleased to know there are exactly THREE dwarven warriors assigned to Yukimatsu, the Kumoshiman fortress in the far-eastern reaches of Caldwen's magiocracy. Bet you didn't know that! The good news is that the general numbers used in the previous article seem to work still when looking at a small area. This experiment is rather obscure and mostly useless, but still interesting at least to me. I had the surprise of finding a good article that suggested averages for population densities in fantasy worlds. This isn't a new topic by any means, but one that has caught my interest during the past many years. Some of you might remember work I did on Mystara's population levels and armed forces. I had used as a starting point material published in the D&D Companion set. This approach worked well for small dominions that player characters might be building in a campaign setting. It broke down, however, when applied to much larger states. I then devised numbers that I could use in a more systematic manner, reflecting hex-based Mystara maps, and preserving my mental sanity along the way. 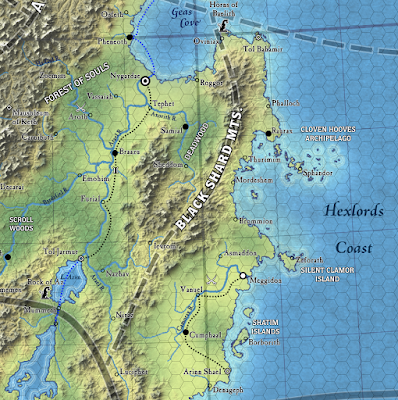 They worked up to a point, though the method used involved manually counting every hex one by one, including partial hexes along coasts and borders, and sorting them by terrain type AND proximity to urban centers/water sources. Exhausting to say the least. I ended up with large, multi-page Excel files. Meanwhile, in my constant search for data and answers on a topic that isn't as well documented (or not documented in a way that I found practical at all), I stumbled across this article: Medieval Demographics Made Easy. It confirmed many of my earlier assumptions, but I had the feeling that the population averages its author suggested were too high. "France has around 36 people per square mile in 1000, and peaks at about 68 in 1300. Meanwhile, Scotland has 4–8 people per square mile. Sweden and Norway have 1–4. England and Wales have 11–30. Italy has 60–95. In other words, population densities below 30 people per square mile are very plausible, while population densities about 100 people per square mile are not likely for a large country." MDME had suggested a range of population densities from 30 to 120 people per square mile. Notes on Medieval Population Geography suggested instead a range of 1 to (somewhere below a 100), which I interpreted as 1-80 people per square mile, deliberately aiming on the low side for my own purposes. Ellyrion: somewhere near 80, making it the local powerhouse. 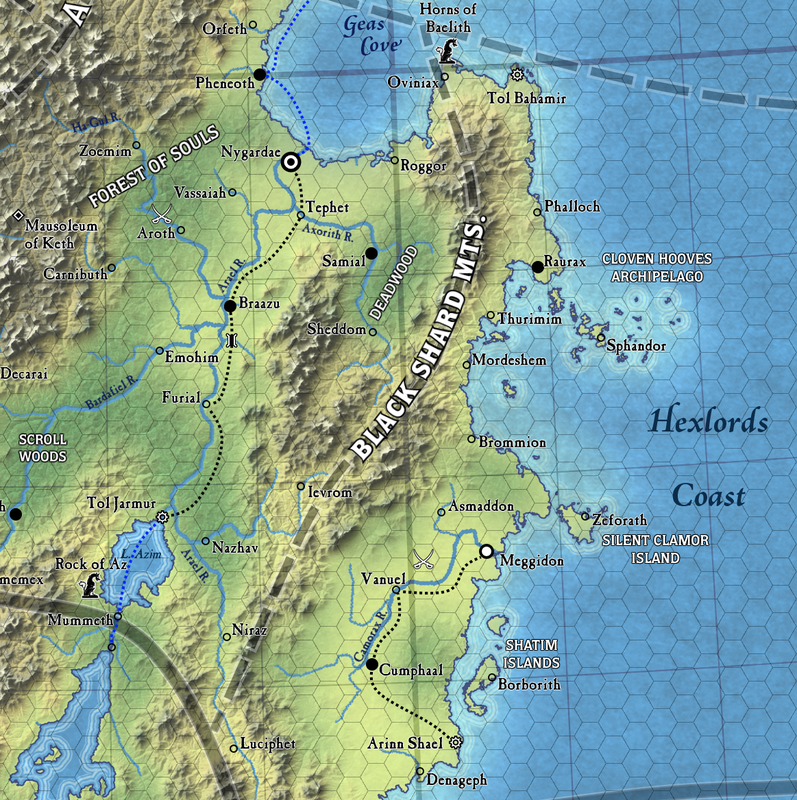 Meryath, Osriel, Caldwen, Phrydias: nearer the mid-range, listed here in in decreasing order of population densities. Alfdain, Narwan, Belledor, Nordheim, and Araldur: near the bottom of the range because of these realms' topographies, vegetation, and prevailing climates. The next step was to determine square mileages. I made my life a lot easier by relying on techniques I didn't have access to back in the 90s. Thanks to Thorfinn Tait's good work (Thorfinn drafts my maps' finals), accurate numbers can be calculated directly from computer generated maps. Armed with this, the areas of internal provinces could be devised, as well as a percentage of what land was settled (versus wilderness). Here's a section of the current map developed for Caldwen. Since I'm working on Caldwen, I tested this new method. Forests and mountains (which are described there as "forbidden to the common population") cover much of the land, so I defined them as "wilderness" (unpopulated), versus the rest of the land (valleys, open plains, and coasts) defined as fully settled (just 60 people per square mile for Caldwen). Once populations were calculated for all the provinces, the total population density for the whole of Caldwen boiled down to... 30 people per square mile, which is where I wanted it to be. Mind you, this still added up to nearly 10 million folk, since Caldwen is a bit smaller than modern-day Germany. This brought up the issue of how many people actually live in cities. I had assumed up to this point that no more than 10% of the total population should be urban, counting everything including villages (trust me--this was a real pain!) This wasn't quite correct anyway. According to Notes on Medieval Population Geography, villages and small towns should really be counted as rural (they concern mostly farmers, local markets, periodical fairs, etc.) The true urban centers are large towns and major cities. This is actually a good thing since it's impossible at the scale of common fantasy maps (certainly at the scale of Mystara and Calidar maps) to account for all the villages and smaller communities that may exist in a realm. This made my job much easier, since there is a limited number of large towns and major cities in the Great Caldera. What the article suggested was about 5%. My challenge was to reconcile the population density determined above with the number of relevant urban centers already shown on the Great Caldera map published two years ago. Yes, much groaning and cursing followed while I pulled and stretched numbers to get a workable basis. By the time the smoke cleared, all small towns had grown into large ones. And even with this, Caldwen still ended up with an urbanization rate of 3%. Ouch. The purpose of doing this is in part to understand how many troops may be available, at least during peacetime. This leads to another decision. Although Calidar is defined as "medieval fantasy," it is more fantasy than true medieval. In this respect, it stays close to its spiritual kin, the World of Mystara. Medieval warfare involved feudal troops (vassal knights, feudal levies, etc.) Some of this remains somewhat true in Calidar. This world's economy is mostly money driven, which comes closer to Western Europe's late 1400's if not its Renaissance period. It's when permanent armies and professional civil servants became more of a norm, more so than granting offices based on nobility or feudal rights. 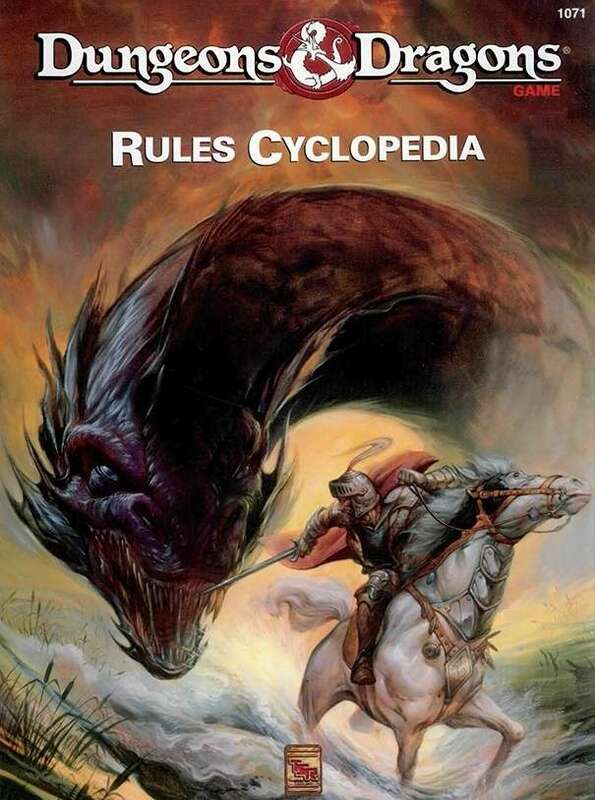 It's also the general style for the World of Mystara (no surprise here). What does all this mean? Realms of the Great Caldera maintain professional, full-time troops during peacetime. I chose this approach for the sake of expedience and sanity, the game masters' and my own. Imagine trying to figure out what troops can be levied from feudal nobility, chart-holding towns, and peasantry, during what season, how far away from their lands, for how long, how many times, and for what purpose, all of which varying with each source? Do alternative scutage fees apply? I'll pass, thank you very much. It's a lot easier for everyone involved if I just say: basic army is "X." Just add more during a war already! Once that hurdle is cleared, then it's easy to assign ground troops, seagoing vessels, and skyships to various locations, based on their strategic values. Such kingly troops amounted to about a tenth of a percent of the entire population of Caldwen. I know that's not excessive. As it were, that's actually an average 3% of urban population. To this, I'm adding town militias, about 10% of town populations (lightly armed and trained, for defense only). Even then, much of the militias only gather when summoned, since these are mostly townsfolk with real jobs. Only a few of them are permanently attached to the militia, to serve as guards and for law enforcement. In other words, each town has local forces under the mayor's control, plus a complement of "royal troops" under the authority of a commander appointed by the head of state (who may have been sent from another part of the realm). The latter troops definitely garrison fortresses built to control key spots in the kingdom. That's about it for now. As I continue designing Caldwen in detail, numbers will probably shift from what I described above. The key to all this is to remain consistent across the board with neighboring realms. More computing on the way!